Ron Lucas has wheeled about with Manta Rays in strong currents off the island of Komodo, and felt the piercing gaze of a mother whale, just a table’s length away from him, as her calf sheltered under her fin in Silver Banks, but when I asked him about his best dive, he recounted an experience in Bermuda’s eastern blue cut, known colloquially as blue hole to experienced divers. “That’s a great dive site – we saw them streaming thought the reefs in that huge group, just mind-boggling,” he said, of the enormous and stain-glass-window-scaled parrotfish traveling in herds. The herbivorous fish abound in Bermuda and some species can grow up to four feet long. His eyes light up as he gestures to capture the flowing motions of the peaceful marine leviathans through the reef, and I know that he is reliving an experience that can’t be put in to words. When asked what drives him, Lucas answered that it was seeing new things underwater – whether it be a spectacularly rare fish, or astonishing new fish behaviour. “The Smithsonian actually picked this photo up,” he says, showing a curious array of Rainbow and Midnight parrotfish, schooling together. 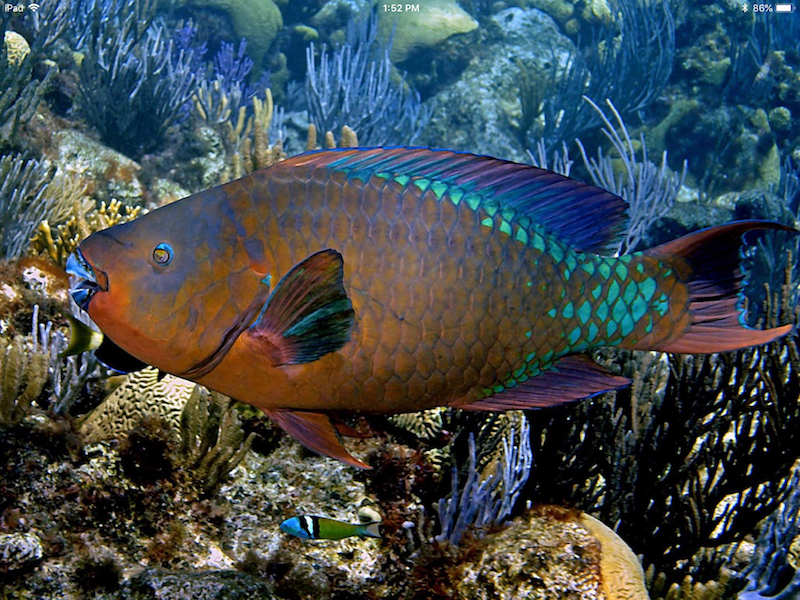 Though the parrotfish were originally thought to be different species, they appear to exist in indiscriminate social groups. He pointed out to me that some of the parrotfish looked mottled – the usual deep black and indigo of the midnight parrotfish actually had some terracotta overtones, reminiscent of the vibrant rainbow parrotfish. His photo had shown evidence of inter-breeding and hybridization in two fish thought to be separate species. Evidence of hybridization. Copyright Ron Lucas and Bermuda Zoological Society. Though Ron Lucas has never had any formal training in marine biology or photography, his thousands of dives, directly observing how fish behave and how the reef changes, have given him a wealth of knowledge. For many years, he’s worked with Reef Environmental Education Foundation (REEF) as their resident photographer. REEF measures fish abundance around the world in order to assess the health of the reef, and the information is input into a data bank in order to set population baselines for ocean research. Ron Lucas was able to travel to Little Cayman and the Philippines as the REEF photographer, and hosted the foundation during three trips they’ve made to Bermuda. Lucas’ passion for underwater photography quickly led him into other endeavors. A few years ago, he released a book called Bermuda Reef Portraits. The book is full of fantastic photography, cataloguing all the common reef dwellers in Bermuda. Lucas promoted the book, going to book signings and the like, until it broke even, and he donated all of the profits from it to BZS. After the book’s tremendous success, he decided to make an app with BZS and has recently released the third version. The app is free, and has many more photos than the book could ever hope to hold, and they are much more easily viewed digitally than in print, where they lose some of their quality. 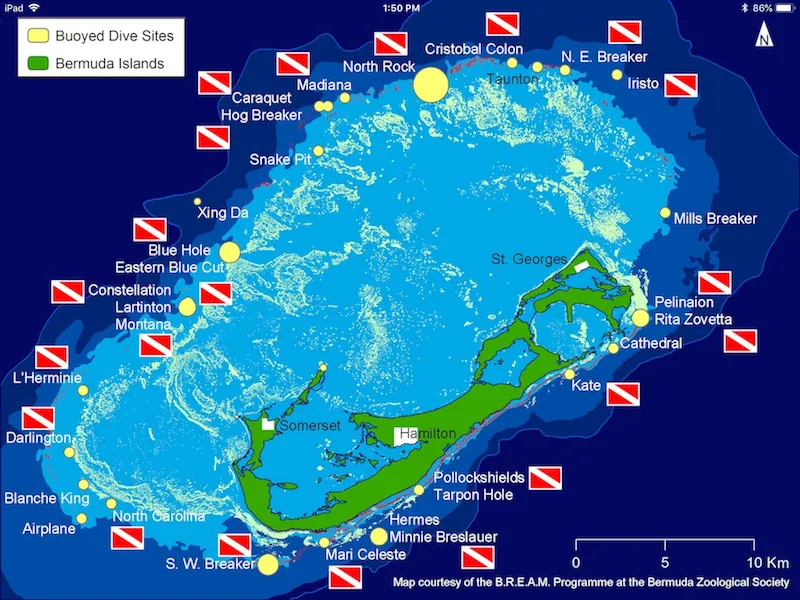 “We have comprehensively covered all the reef species of Bermuda,” Lucas proclaims. He explains that a few species were added in the app’s latest update, but that the app doesn’t include sharks and some other interesting species because they don’t live on the reef, and the app is meant to be for reef identification only. App interface. Copyright Ron Lucas and Bermuda Zoological Society. With different sections for different reef life, the app is easy to use for laymen and helpful to even experienced divers – you can scroll through pictures from wrasses to silvery fish, and each picture has a helpful blurb with the species name and information, all written by Lucas. The newest version of the app also includes corals, which a scientist from BZS helped put together alongside Lucas. 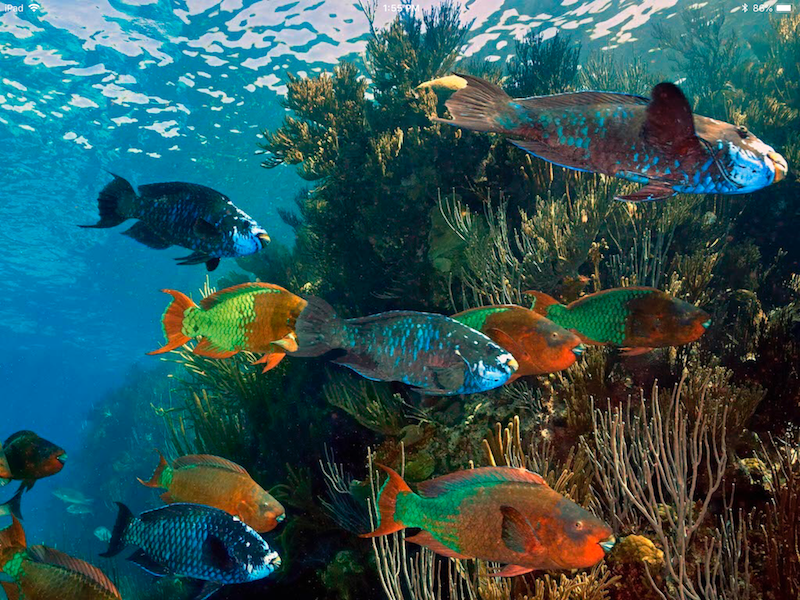 Reef fish are reliant on corals, and the new section encourages the appreciation of the entire ecosystem. The app is recommended to students of REEFWatch, a reef data collection and health initiative, who can use it to ID fish, and now, corals, in order to collect accurate data. 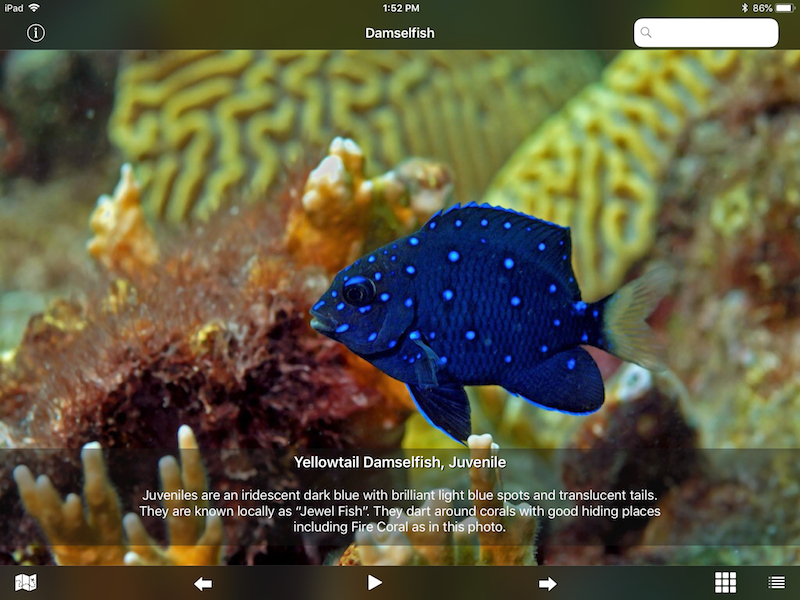 The app goes beyond being a simple fish ID guide, giving a holistic picture of the reef. There’s no better example of its versatility than its ‘reef activity’ section, where Lucas has captured interesting fish behaviours, including the tendency for wrasse to clean larger fish of parasites, the extraordinary camouflage various reef creatures exhibit, the curious symbiotic relationship between eels and groupers, who sometimes hunt together, and more. In addition, the app also has an informative map, made with the assistance of Thad Murdoch, which outlines the different types of Bermuda reefs and protected areas. It also has a handy dive site guide, including wrecks and coral outcroppings, where you can tap individual sites for more information. The lively descriptions might give some history of the site, or an account of the species most commonly found there, from Lucas’ direct observations. Copyright Ron Lucas and Bermuda Zoological Society. To many, the thought of ambushing a shark chills to the bone, but for Ron Lucas, it’s seeing new things that fuel his passion. He had never taken photography seriously until he started diving, and he is almost completely self-taught. From humble beginnings with film, which was often a struggle to reconcile with salt water, he now owns two professional cameras and a leak proof underwater housing, which is carved out of a solid block of aluminum. Lucas explains the difficulties of underwater photography, in that you have to choose what you’re going to shoot before you go diving. It’s impossible to change lenses underwater, so you have to pick between macro and wide angle. “You may choose macro, and if a whale comes along – hard luck, you might get its eye. If a beautiful shrimp appears while you’re doing wide angle – hard luck,” he says, laughing. Because Lucas has been diving for twenty-two years, and he has done more dives than the average diver has in their whole life, he can see the reef changing before his eyes. “I can remember lying in the water, next to this huge grouper. I’m staring in his eye, he’s staring in my eye – it’s a wonderful thing. Andrew [Stevenson] talks about magical whales, and that’s what it was like,” as he remembers the wise, piercing stare of the gentle black grouper. Sadly, Lucas remarks that he thinks the black grouper will die off in the next few years. BREAM data this year have shown that Bermuda’s predator fish are highly overfished, with numbers of black grouper and grey snapper critically low. Black grouper and butterflyfish. Copyright Ron Lucas and Bermuda Zoological Society. “We are really trying to take too much out of the ocean,” Lucas remarks. While two or three years ago he could see the black grouper, as well as other grouper species – Nassau, Yellowmouth, Yellowfin – none of them are common around Bermuda’s reefs anymore. The black grouper is a gulper feeder and apex predator on Bermuda’s reefs, but is also considered one of the tastiest fish in the ocean. In Bermuda, fishing regulations limit groupers to one fish per boat per day, and a caught grouper must be longer than 37.5 inches. The first restriction ensures that not too many groupers are caught, and the second aims to ensure it has had the chance to mature sufficiently and breed before being fished out, but it may be time to ban fishing for grouper entirely. When asked about the things that threaten reefs the most, Lucas replied, “It’s global warming, overfishing, lionfish, and plastics. 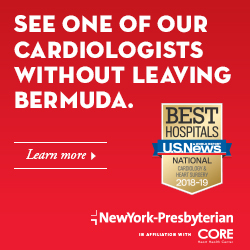 Those are the things that worry me.” Though Bermuda hasn’t seen the full effects of global warming on our northern reefs yet, warm water temperatures cause corals to become stressed and disperse their zooxanthellae, causing coral bleaching. It is when bleaching occurs that diseases such as yellow band or black band can infect coral tissues and cause lasting damage. Alarmingly, Lucas has stopped going to the Carribbean because the reefs have become so decimated. 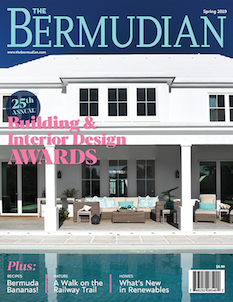 In Bermuda though, he praises our spectacular hard corals and parrot fish. 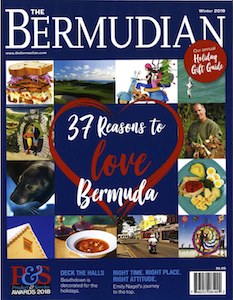 “Parrotfish in Bermuda are resplendent,” he says, praising Bermuda for our work to protect the species, which is a keystone for the reef, and without which might mean a cascade of extinctions throughout the marine ecosystem. Rainbow Parrotfish. Copyright Ron Lucas and Bermuda Zoological Society. Lucas is impressed by the astounding variety of Bermuda’s reef systems, citing the “beautiful breakers on south shore, the swim-throughs, the wrecks, of course, and the Bermuda platform that goes out miles and miles to north rock.” With the northernmost reefs in the world, and fantastic tableaus of hard corals, Bermuda’s reefs are some of the most robust and healthy. Interestingly, Lucas was taught to dive by his son, though it’s usually the other way around. 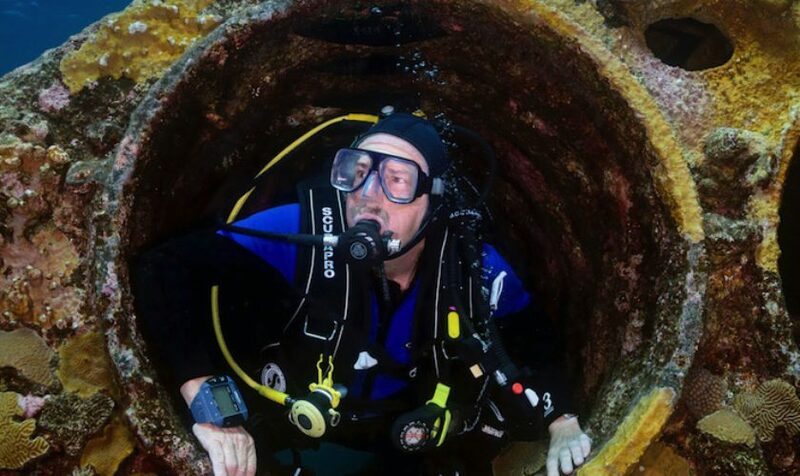 After he became a dive instructor at Blue Water Divers, he attempted to get everyone in his family to learn to dive. “It was my wife first, then my daughter, then daughters and sons in law,” Lucas chuckles. He was the last to learn to dive, but he remembers being the most enthusiastic about it, and soon began to dive far more than anyone else in his family. Lucas was apprehensive to start diving due to a childhood accident that resulted in a burst eardrum. The ear still gives him trouble, but for the most part he has overcome the problem of equalization when adjusting to underwater pressures. “I still remember the feeling of being neutrally buoyant in the water for the first time,” Lucas reminisces with wonder. “Divers dive as much as they can, and then they get to a period around 40-60 dives where they think, is that it? Have I reached the end?” Lucas is a firm believer that you have to have a specialization to keep diving interesting. For him it’s photography, but you can develop your skills in diving and take it in a multitude of different directions. He encourages everyone to experience the magic of the marine world by diving, and stay invested in it by having a secondary interest under the waves, whether it be rescue diving, fish identification, or photography, like him. Download Bermuda Reef Life HD.